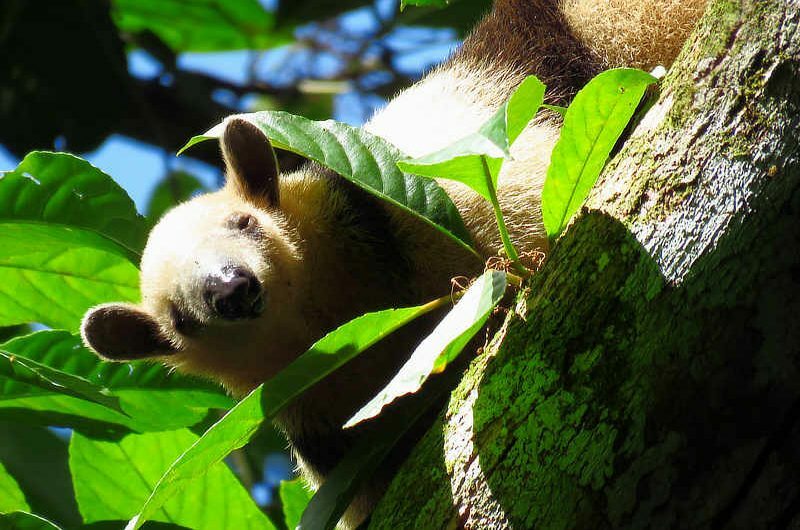 The Northern Tamandua, also known as the Lesser Anteater or Vested Anteater, is a medium-sized anteater found in the tropical and subtropical forests of Central America and northwestern South America. This muscular mammal has a total length of up to 130 cm, and its long, muscular prehensile tail makes up half of its body length. It has a long snout and small eyes and ears. It has a robust, muscular body with thick, short arms and legs. It is pale yellow to grayish overall, with a distinct black vest, a feature that is often lacking in the Southern Tamandua of the Amazon Basin. Males and females are similar in size and color. The Northern Tamandua is specially adapted to its diet. Its long tongue extends from its small mouth for picking up ants, termites and bees. It has no teeth, but its oral cavity is modified to accommodate its very long tongue. It has reduced jaw muscles and mandible. The Northern Tamandua is both arboreal and terrestrial, spending up to 40% of its time on the ground. It has strong forefeet with big muscular pads and sharp thick claws and is well-adapted for climbing and grabbing. It is both diurnal and nocturnal, and time of activity is based on individual preference. It shuffles noisily along the ground or up in trees, and is often seen tearing dead wood and termite nests for food. It climbs trees and vines when disturbed but is usually fairly calm and allows close approach. When not foraging, it dens in hollow trees or logs, or holes in the ground. It may be found sleeping on a shaded tree branch during the day. Overall it is solitary and usually silent, but may wheeze or salivate when threatened. Its home range is up to 75 hectares. Northern Tamanduas breed at any time of the year and females give birth to one young, which remains with the mother and rides on her back for up to a year. In Panama, Northern Tamanduas are fairly commonly encountered in the lowland rainforests and forest edge. It is one of our favorite and most fascinating mammals to see around the Canopy Family lodges.